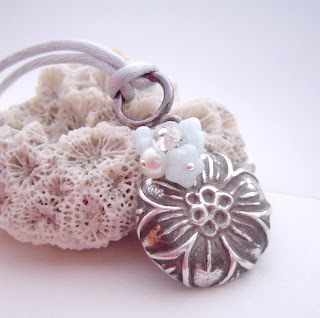 art clay pendant, originally uploaded by ebbandflo_pomomama. We (the Wee Guy and I) made this a couple of weeks ago. It's a pendant for Mothers' Day to be sent to my mother (who, being in the UK, has her own Mothers' Day a couple of moths earlier than in North America). It's become a struggle to know what to give for celebrations since I live so far from family and don't see what their day-to-day life is really like. I'm certain that some items never see the light of day again and others are a tad disappointing just because I have no idea what current tastes are! This one, I hope, is a winner (and now not a surprise unless Ma doesn't read my blog - fairly sure she doesn't!). It has a smudge of a fingerprint from her (only) grandchild and her name spelled the way she likes it. 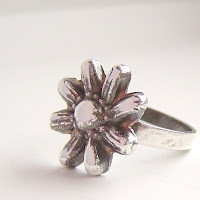 It is also handmade, unusual and unique AND almost pure silver since it is made from art clay silver. rotational symmetry, originally uploaded by ebbandflo_pomomama. My eggbox must have symmetry of one sort or another. It completely throws me if I have to disturb the arrangement by taking out an inauspicious number of eggs. 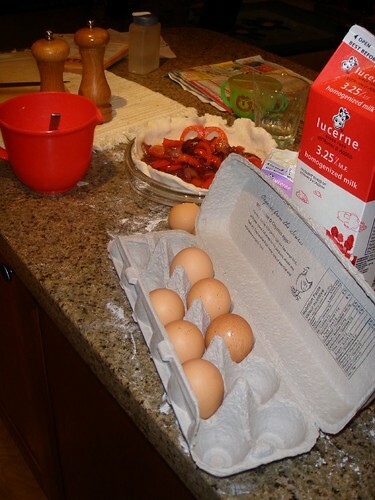 Determining the symmetry of the remaining eggs can add minutes to a simple task. I will even rearrange the eggbox after mr ebb has been tinkering with it (sometimes i know he does this on purpose). Asymmetry in my domestic surroundings disturbs me. 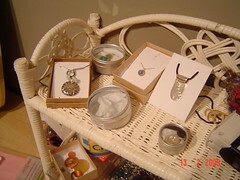 ...... but not in necklaces, wire crochet cuffs or other pieces of jewelry I make (with the possible exception of earrings). I am not sure what this says about me. erm! At this time of year rich colours aren't really my thing - after dismal days of endless rain the last thing I want to see on the crafting desk in front of me is darkness. 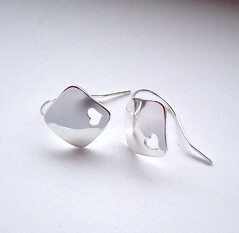 Hence for me spring is what I focus on and pull out the greens, whites and aqua's to go with very shiny silver. But I guess I do appreciate the dark colours, as shown in the byhand.me spotlight above. 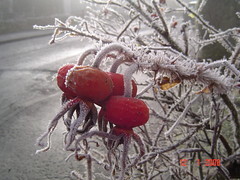 I've even blogged about my winter hips necklace in greys, black and reds which was inspired by this photo taken last christmas in scotland. My sister jokingly referred to it as my 'winter hips' so the name stuck (but thankfully the pudge didn't!). 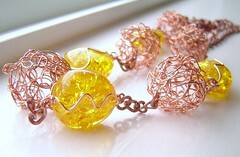 For some reason whenever I do think of rich colours I reach for the copper wire or even pewter. 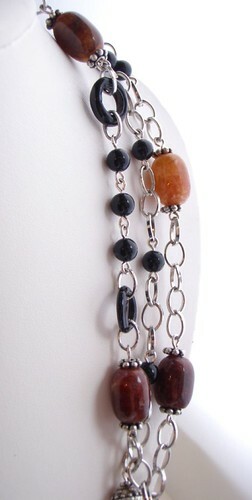 Copper seems to contrast well with jewel tones and even clash beautifully with hot pink. Silver just seems too bright and shiny to be weighed down with rich tones (though dead centre above you can see I've started oxidising it!). 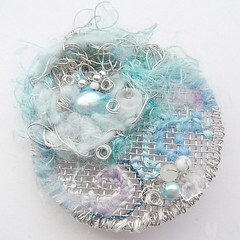 My comfort zone is seafoam, aqua, pale green, white; all elements which blend well with polished sterling. Except in cufflinks - making jewelry for men throws me into the rich colours world and there I am happy to mix it with the silver. winter hips necklace chain detail, originally uploaded by ebbandflo_pomomama. In this part of the world endless winter conjures up not images of vast snowfields but days and days of pouring rain. Last week's sun is a distant memory as the wet stuff pours from the sky. 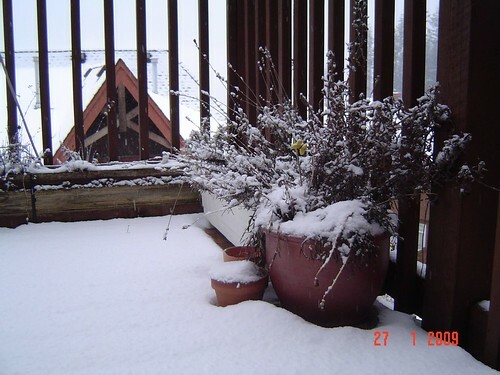 Mustn't grumble - it'll be falling as snow at higher and colder elevations (and maybe here too if the Google weather forecast can be believed. OK so I didn't get a table at the craft fair, and I am fed up with having an achy neck, and maybe it would be nice to feel inspired and creative again. Chill - it will happen! I've got a lot of other things On My Plate which need clearing before then. And I guess I'm just stressing a little about them. I have had some cool new ideas for some wire crochet creations, all a little more out-of-the-box than my previous ideas and am itching to try them out. (makes mental note: write them down somewhere!). I also attended a really inspiring seminar given by an artist exhibiting her awesome textile art at Place des Arts which made me think about my 'flotsam' on a slightly different scale. Ho hum - need some more time in my day (and energy, damn flu). If you are in the area check out Kirsten Chursinoff's exhibition, on until mid March. Her beach pieces are my personal faves. I have managed to list a few new items for sale (including 'winter hips' above and have even got all spring-y with a spring greens section in my etsy shop. Today I will be working on some packaging inserts to give my products more polish and a professional air. 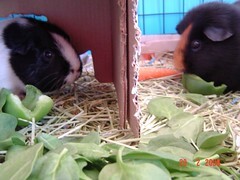 The cavies however, will be eating non stop and attending to some nap time. the wee guy and i finished an art clay pendant. 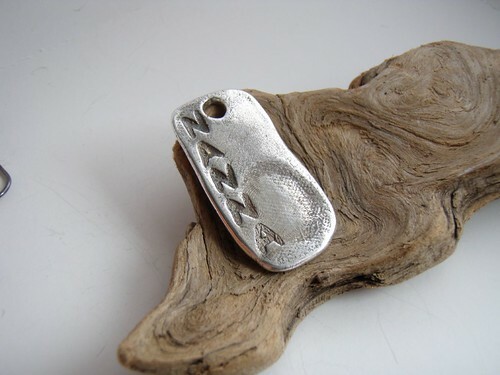 instead of polishing away the fingerprints we made a feature of his thumb mark by oxidising the piece after firing. 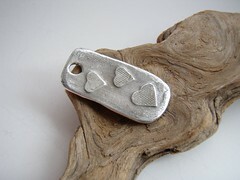 the reverse shows some hearts i etched in before firing then burnished after oxidising to make them stand out. it's similar to the leaf pendant we made before christmas but oxidised. Mother's Day in the UK comes up towards the end of March, and although she's banned receiving anymore of my jewelry i think she might be happy to receive this pendant. wee guy and i are planning a trip to the gym, school, clay and then picking up a bracelet. .... but it means i've now got to get used to a whole heap of new technology in the limited time i have available in peace every day. - the wee guy woke up to find a miniature red rose bush and a valentine's card at the end of his bed - his face was a picture, so chuffed! In short, I have no idea ..... but I know how I like to read a 'how to'. Last year I was lucky enough to receive some fantastic ceramic moulds to test out for the amazing Lisa of seaurchin (who has worked as a sculptor/model maker for Aardman Animations). After some correspondence she sent me two types of mould to try out with Art Clay Silver (ACS). Whee! and what fun it was! 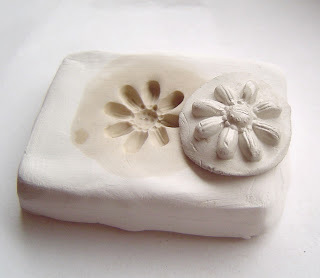 The pieces themselves were very detailed and beautiful flower push moulds, producing intricate patterns in the clay. I documented each step and tested out several different methods of using them with the ACS. So finally I could send Lisa my findings, summarised on this web page and complete with pictures. So it's been a bit quiet on the old blogging and crafting front then? Not completely - I've been tinkering away at a few projects and even managed to give a private chainmaille class last week so my energy levels are returning slowly after The Plague. 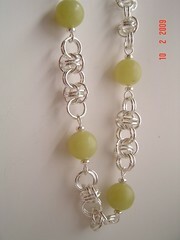 One of the weaves I taught was this orbital chainmaille pattern. 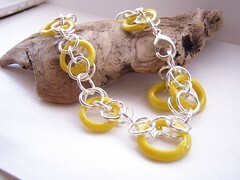 While I love the look of maille on its own, I prefer to use it as a 'host' for other bits of beading paraphernalia. 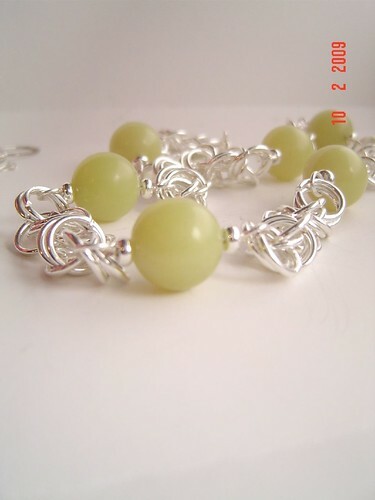 In this case I've included some gorgeous chunky serpentine beads between the links and made a fresh spring choker. 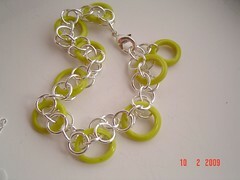 I also had some fun with a parallel weave and some glass hoops. The glass hoops are not linked in but instead held in place by the interconnected jumprings. There is therefore no stress on the glass at all. Another fresh spring piece! Last night I completed and catalogued another clutch of felty goodness which is being delivered to Place des Arts this afternoon. 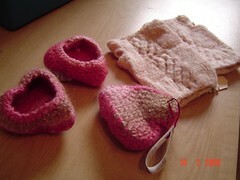 Goodies include some freshly felted soy and wool heart bowls, and two pairs of felted wrist warmers. .... and I also delivered a few items for display/sale at my local garden centre (thanks for the coffee and scone, Moira!). Bush fires are raging in Victoria, Australia causing incredible damage and loss of life. Entire towns are razed to the ground. Donate to the Red Cross appeal directly here. For more details and information please check the BBC website for coverage. 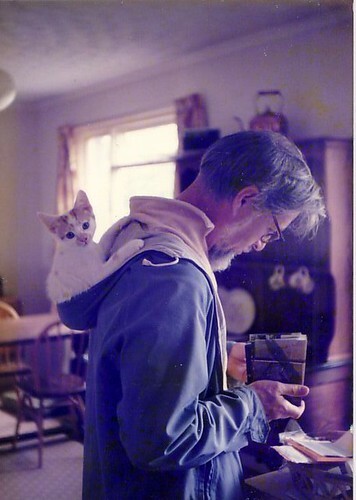 dad and mauz, originally uploaded by ebbandflo_pomomama. Feeling almost back to normal (I managed to make something last night yippee!) although food no longer holds any attraction for me. This is good for the post-christmas pounds shedding but not great for keeping up with the wee guy, who as usual is approximately 24 hours further along in the recovery energy stakes than I am. So I'm feeling a bit wide-eyed about getting out and about again, but also relieved. 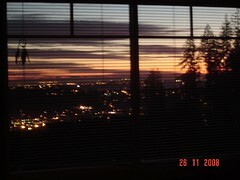 view fom the deck d27/365, originally uploaded by ebbandflo_pomomama. don't you just hate it when the tail end of a cold/flu/bug/virus comes back at you? i spent all saturday using up my precious energy on the housework (which was overdue by about a week or more due to the current round of ill health) thinking that i could have a nice peaceful sunday to myself.